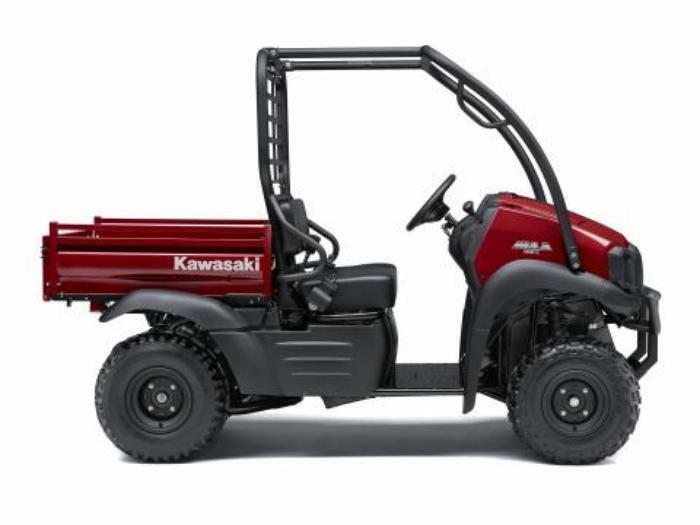 The 2017 Mule utility vehicle is a four-wheel off-highway vehicle with side by side seating for two to six people and automotive style controls. The model name is printed on the right and left front fender. For the Mule SX series and the Mule 4000 series, the vehicle identification number (VIN) is located under the seat. For the Pro models, the VIN is located on the steel frame between the right front lower A-arm mounts. The 2017 Teryx recreational off-highway vehicle is a four-wheel off-highway vehicle with seating for two or four people and automotive style controls. The model name is printed on the right and left front fender. The VIN is located on the steel frame between the right front lower A-arm mounts. The 2017 Brute Force 750 4x4i all-terrain vehicle is a four-wheel off-highway vehicle with seating for one person. The model name is printed on the right and left front fender. The VIN is located on the steel frame between the left front lower A-arm mounts. The vehicles were sold in various colors. The vehicles, manufactured in the U.S., were sold at Kawasaki dealers nationwide from March 2017, through April 2017, for between $8,000 and $15,000. Consumers should immediately stop using the recalled vehicles and contact Kawasaki for a free repair. The firm is contacting all known purchasers directly. Consumers may contact Kawasaki toll-free at 866-802-9381 from 8 a.m. to 5 p.m. (PT) Monday through Friday or online at www.Kawasaki.com and click on “Recalls” for more information.